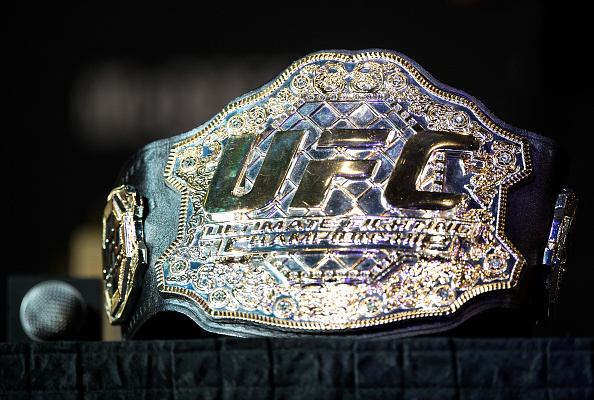 There have been nine men who have carried the UFC welterweight title over the just about 20-year history of the belt, beginning with Pat Miletich and carrying forward to Tyron Woodley today, with Matt Hughes and Georges St-Pierre standing as the only two-time champions in the 170-pound weight class. Over that time, there have been 37 welterweight title fights (not including interim championships) that have produced some of the most iconic moments in UFC history. From massive upsets and incredible comebacks to heart-warming triumphs and heart-stopping intensity, the battle for gold in the welterweight division has delivered it all over the last two decades. Now it’s time to look at the very best of those moments. This is The 10: Best UFC Welterweight Title Fights of All-Time. There are so many layers to this one. First, Hughes was a protégé of Pat Miletich, the UFC’s first welterweight champion, who lost the title to Newton 183 days earlier at UFC 31. Second, it was an intriguing clash of styles between the powerhouse wrestler Hughes and the jiu-jitsu specialist Newton, who opened the fight by pulling guard and hitting a tremendous sweep early in the fight. And then there is the way this one ended. After a chess match on the ground in Round 1, the second begin with Hughes completing a forceful slam in the center of the cage and opening up with punches from top position when Newton began locking up a triangle choke. Hughes promptly scooped the Canadian champion up and carried him to the fence, where Newton tightened his choke and started pulling down on Hughes’ head. Suddenly, Newton was plunged to the canvas and knocked out cold, forcing referee John McCarthy to wave off the fight. But if you watch Hughes’ body language in those closing seconds and immediately after McCarthy stepped in, the powerful slam that put “The Ronin” out looks more and more like inertia bringing him crashing to the ground because Hughes may have been completely out due to the choke, a fact Hughes confirmed after the bout when he tells Miletich “I was out” in his corner moments before getting the welterweight title strapped around his waist. Hughes would defend the title against Hayato “Mach” Sakurai at UFC 36 before defeating Newton by TKO stoppage in the fourth round of their rematch to solidify his place atop the division. There was a lot of trash talk between these two heading into this one, with Trigg believing he was the man to unseat Hughes and the champion confident that the challenger had nothing to offer him inside the Octagon, with fans and pundits believing this was the toughest test of Hughes’ career to date. Trigg shot for a takedown immediately and controlled the action through the opening 90 seconds before Hughes scooped him, walked to a better position in the cage and slammed him to the canvas. The next 90 seconds were back-and-forth on the mat – attacks and counters, scrambles and reversals – until Hughes took Trigg’s back. While the challenger stood and tried to fight hands, the champion cinched in the choke and drew the tap just before the tandem fell backwards to the canvas. It lasted less than a round, but it was all kinds of fun and wouldn’t be the last time these two shared an iconic moment in the Octagon. After essentially cleaning out the division by defeating Trigg, Hughes’ next title defense came against the former lightweight standout Penn, who was returning to the UFC after a one-fight departure and begged matchmaker Joe Silva for the opportunity to test himself against the dominant champion. Hughes went to his back in the opening minute, but it quickly proved to be a tactical mistake, as Penn controlled the action from top position, outworking Hughes on the canvas. With just under a minute left in the opening round, Penn landed a clean right hand and then passed to side control before quickly shifting to mount. From there, Hughes gave up his back, Penn unloaded with punches and snaked his arm under the champion’s neck, forcing him to tap in the closing stages of the first. This was a truly incredible performance from “The Prodigy,” who could barely get the words out during his teary-eyed post-fight interview with Joe Rogan after the bout. After Penn was stripped off the belt just over 100 days into his reign, Hughes claimed the vacant title with a win over Georges St-Pierre at UFC 50, beginning his second stint atop the welterweight division. His first defense would come against a familiar foe as he squared off with Trigg for a second time. Once again, the pre-fight build-up was contentious, with Hughes mocking Trigg’s submission defense and the challenger calling his previous loss “a bad day” while promising a different outcome. Just under a minute into the opening stanza, Trigg connected with an accidental low blow that drew a warning from referee Mario Yamasaki, but didn’t prompt a stoppage and the challenger looked to capitalize. Trigg unloaded with ground-and-pound, passed into side control and then mount before taking Hughes’ back and working for a rear-naked choke. 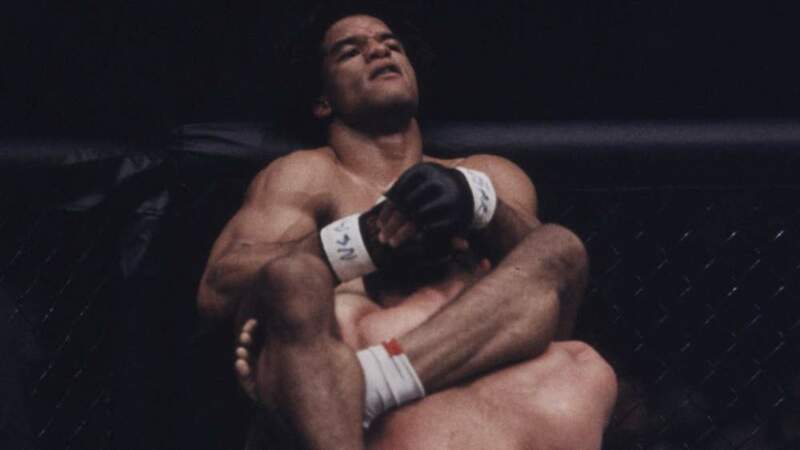 But Trigg couldn’t secure the choke and Hughes rolled into top position before gathering the challenger’s body, hoisting him into the air and carrying him clear to the other side of the Octagon before dumping him to the canvas. Hughes instantly floated into mount and started unloading with his own strikes from top position. When Trigg rolled, giving up his back, Hughes fished his arm under the neck and squeezed out another victory. Two years after their first encounter at UFC 50, Hughes and St-Pierre found themselves on opposite sides of the Octagon for a second time, with the welterweight title once again hanging in the balance. But where the veteran was able to better the neophyte the first time around, the sequel became a changing of the guard atop the 170-pound ranks. St-Pierre’s athletic edge was evident early, as the challenger worked behind the jab and kept the champion off balance with a diverse array of kicks. Midway through the opening round, time was called on back-to-back strikes as St-Pierre landed inside kicks that also caught Hughes low, prompting John McCarthy to warn the French-Canadian. So St-Pierre went high with the next kick and staggered Hughes a little before continuing to pepper Hughes with a nice, long jab and dumping him to the canvas after catching a kick. In the final seconds of the round, St-Pierre sat Hughes down with a pair of left hooks following a Superman punch, with the champion seemingly being saved by the bell. After connecting with a couple clean shots in space early in the second, St-Pierre went upstairs with his lead leg and put Hughes on the canvas, following up with a torrent of unanswered punches that forced referee John McCarthy to step in and St-Pierre to collapse to his knees, swarmed by his coaches in the center of the Octagon. A little shy of five months after ascending to the top of the division by stopping Hughes, St-Pierre ventured to Houston to defend the welterweight title for the first time against Serra, a tough journeyman who earned his shot at the strap by edging out Chris Lytle in the welterweight finale on Season 4 of The Ultimate Fighter. It was expected to be a cakewalk defense of his championship for the newly minted titleholder, but Serra had other ideas. After largely being stuck on the end of St-Pierre’s long jab and kicks to begin the fight, Serra started to get inside to work the body. Just before the two-minute mark of the opening frame, Serra knocked St-Pierre off balance with a clubbing right hand, connecting with more of his arm than anything else, but rather than reset and clear the cobwebs, the champion tried to fire back and it proved costly. Serra started teeing off on St-Pierre’s chin, connecting with multiple clean shots that put the champion on roller skates. When St-Pierre stumbled backwards to the canvas, the challenger pounced and pounded out the most improbable championship victory in UFC history. 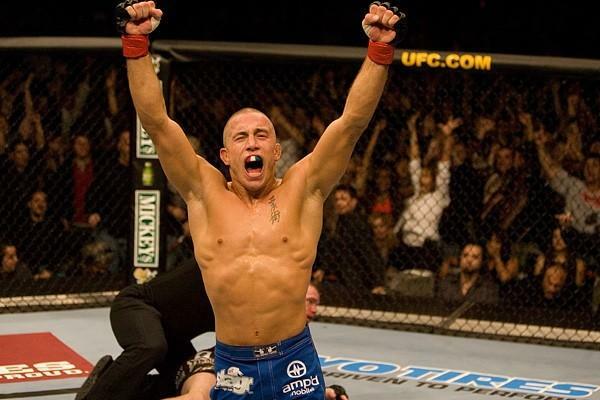 Following his loss at UFC 69, St-Pierre would defeat Hughes in their trilogy bout at UFC 79 to claim the interim welterweight title and unify the belts with a second-round stoppage win over Serra in their rematch at UFC 83 in Montreal. Now back atop the welterweight division, it was time for the two-time champion to defend his title for the first time against the surging Fitch, who entered sporting an 8-0 record in the UFC and riding a 16-fight winning streak. His first attempt at defending the belt went sideways, but his second was an absolute masterpiece. Over the course of five rounds, St-Pierre showed the depth of his arsenal, dominating the former Purdue Boilermaker on the canvas and piecing him up on the feet. It was a complete mauling by the champion, who memorably sent Fitch’s mouth guard spinning out of his mouth at one point and earned the victory with scores of 50-43, 50-44 and 50-44. This cemented the fact that St-Pierre had moved past the trauma of his loss to Serra and kicked off an incredible run of dominance atop the welterweight division for the French-Canadian superstar, who would successfully defend the title nine times before pressing pause on his career following his win over Johny Hendricks at UFC 167. Four months after St-Pierre edged out Hendricks, the Oklahoma State product would rise to the top of the division at UFC 171 with a unanimous decision victory over Lawler in a thrilling affair that injected new life into the division. Nine months later, they would do it again and while the sequel was every bit as close and hotly contested, the outcome was different. More than a dozen years after stepping into the Octagon for the first time, Lawler made good on all the expectations and projections that were foisted upon him at the start of his career by winning the UFC welterweight title. It was the culmination of an incredible two-year resurgence for the quiet knockout artist whose career seemed to be adrift during his time competing under the Strikeforce banner. While the fight was another tight and tense affair, the lasting image of this contest isn’t an exchange between the two in the waning moments of the contest, but rather Lawler walking out of the Octagon, the belt wrapped around his waist, repeating the word, “Finally” over and over. After 35 fights, he had finally won UFC gold. This is the best fight in UFC history. You could make a case for a couple others, but pound-for-pound, all things considered, this is the one that tops the list for me and as good as it remains every time you watch the replay, it was the kind of fight that leaves an imprint of your soul if you were fortunate enough to catch it live like I did. Lawler and MacDonald had fought to a split decision 18 months earlier at UFC 167, with Lawler coming out on the happy side of the results. After three straight victories, the Canadian contender secured the rematch and his first shot at UFC gold. What followed was a 21-minute display of skill, toughness, heart, determination and focus unlike anything I had seen before or witnessed since. After a patient start, business picked up in the second and reached its peak at the end of the fourth when the fierce competitors, their bodies smeared with blood and the canvas looking like a crimson Jackson Pollock painting, stood locked in a gaze in the center of the cage for what felt like an eternity. Lawler would earn the stoppage a minute into the fifth round, MacDonald’s body giving out before his heart was willing to concede defeat. If you’re looking for one fight to show friends who want to know why you love this crazy sport so much, you can’t go wrong with this one. Six months after going to war with MacDonald, Lawler would successfully defend the title in another close, hotly contested battle at UFC 195 against “The Natural Born Killer,” Carlos Condit that would earn Fight of the Night honors at UFC 195 and Fight of the Year consideration. Six months later, he was back to defend his title again, stepping in against the dangerous, but underestimated, Woodley, who had been on the sidelines for 18 months after a fight with Hendricks at UFC 192 fell through at the 11th hour when the former champion had issues with his weight cut. With the challenger, it was never a question of talent, but rather which version of Woodley would show up – the explosive finisher or the hesitant, low-output fighter? As it would turn out, both versions would turn up as Woodley spent the first two minutes patiently stalking Lawler, measuring distance and getting his timing down before the second right hand he threw landed flush on the champion’s chin and sent him crashing to the canvas. A storm of punches followed in rapid succession and referee Dan Miragliotta jumped in to wave it off, bringing Lawler’s time at the top to an end and starting the clock on the reign of “The Chosen One,” which continues to this day.